A Weekly Magazine Devoted to the Theosophical Movement, the Brotherhood of Humanity, the Study of Occult Science, and Aryan Literature. Los Angeles, then San Francisco, CA. Publisher: United Lodge of Theosophists. The journal was originally started in Los Angeles in 1912. 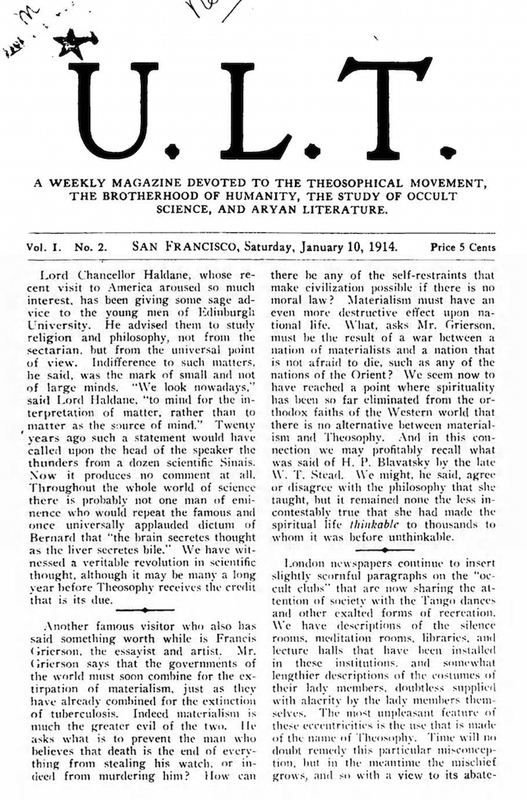 With the move to San Francisco, the journal was restarted with volume 1, number 1, on January 3, 1914. 8 pp., 5 cents an issue. The U.L.T. was the work of Robert Crosbie (1849-1919), a Theosophist who had followed Katherine A. Tingley in the split of Theosophy after the death of W.Q. Judge. He in turn broke with Tingley over what he felt was the cult of personality in her group and her ignoring or deviating from what he felt were the original teachings of H.B. Blavatsky. In 1909 he started the U.L.T., emphasizing the importance of anonymity in spreading word about Theosophy—characteristic that is apparent in this journal. Related journals of the same name, distinguished only by the addition of their place of publication—New York U.L.T., San Diego U.L.T., Philadelphia U.L.T., etc.—were published by the lodge. LOC; Los Angeles Public Library; Metropolitan Cooperative Library System; University of California, San Diego.